Apple has said it is “looking into” reports of an exploding iPhone 7 Plus. Brianna Olivas, an 18-year-old in Tucson, Arizona, posted a video on Twitter on February 22nd showing a crack in the back of her phone. It seemed to be deformed by a swollen battery and smoke was pouring out of it. Olivas told Mashable that she had visited an Apple store the day before the incident and told technicians that her iPhone 7 Plus would not turn on. They inspected the phone and told her everything was fine after the phone began to work properly again. However, it didn’t stay working for long. “The next morning I was asleep with my phone charging next to my head, my boyfriend grabbed the phone and put it on the dresser,” she told Mashable in a direct message on Twitter. “He went the the [sic] restroom … and from the corner of his eye he saw my phone steaming and [heard] a squealing noise. 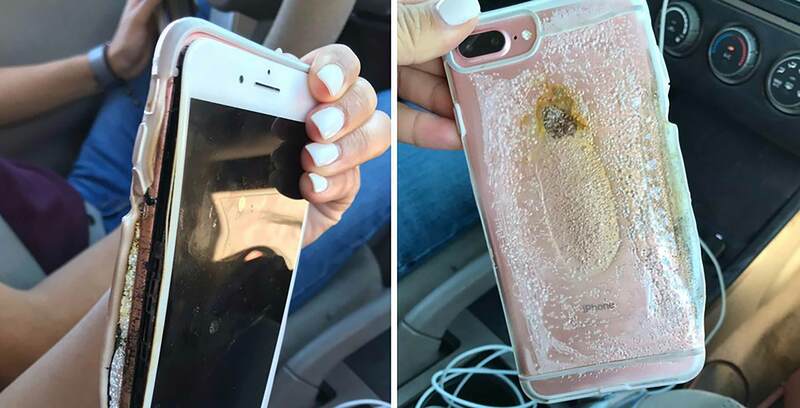 By the time he got over to the phone it had already caught fire, he quickly grabbed the phone and threw it in the restroom … as soon as he threw it in the restroom is [sic] blew up and more smoke started coming out of the phone.” Olivas said she’s since returned the phone to Apple. She said representatives of the tech giant have told her they’re conducting tests and expect to know more within a week. “We are in touch with the customer and looking into it,” a spokesperson told Mashable. Although Olivas’ iPhone situation may bring to mind the Samsung Galaxy Note 7 battery issues, it currently appears to be an isolated incident.